It’s that time of the year again! 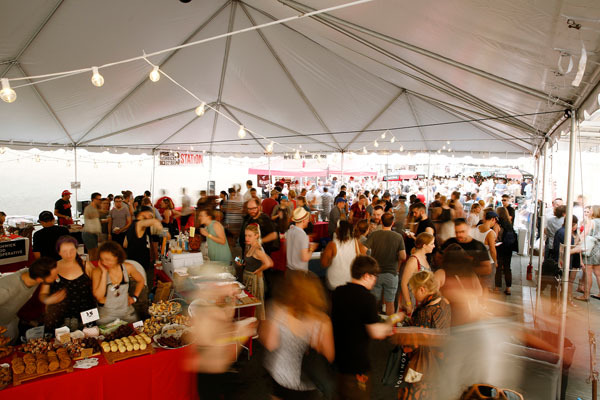 Taste of Bushwick, the annual food party celebrating the eats, drinks, and merriments of Bushwick, returns for its 5th year on Tuesday, June 12th, benefiting The Bushwick Starr, an Obie Award winning, not-for-profit theater. This year, the event – which will feature 40 vendors, from breweries and distilleries to local restaurants, coffee shops and specialty food makers – will take place indoors for the first time ever at the spacious new Brooklyn Steel venue, adding creature comforts and eliminating any potential issues with inclement weather. Tasting tables will be set up throughout the venue, in the lobby, main space, and balcony. Some of the first-time participants this year include Precious Metal, serving up vegan (and non-vegan!) queso along with a Clear Bloody Mary; Bushwick Grind with their jerk shrimp tacos, specialty toast, and jive turkey burgers; Brooklyn Cider House pouring refreshing specialty hard ciders; Oddfellows Ice Cream; and locally roasted Sey Coffee. On the beverage front, Braven Brewing will be serving mini chili dogs and their locally brewed beer; Tito’s Handmade Vodka will be pouring a Mint Lemonade cocktail; Bruce Cost will be on hand with their locally brewed ginger ale, and more! Guests will also be entertained throughout the event by DJ Monikkr along with a Bosco Lite photo booth where they can take animated GIFs. Tickets are available here and start at $45, as a “Hungry Bird Special” and go up to $55 on June 1st. Tickets include all food + drinks at the event, all night long. VIP level tickets ($85) grant guests early entrance to the event, starting at 5:30 p.m., as well as access to a new VIP market where they can fill up a special anniversary tote with all kinds of local NYC food and drink swag.